Now in their third decade, Lutronic has entered an exciting new era of Intelligent Design for Intelligent Care™. During two sessions at the American Society of Lasers in Medicine and Surgery (ASLMS) conference, Lee Pannell, chief operating officer of Lutronic Global, explained how their novel medical lasers and devices incorporate proprietary technologies to enhance a practitioner’s ability to provide outstanding care for their patients. For some procedures (such as wrinkle reduction or laser hair removal), several weeks may pass before a practitioner knows if the traditional treatment was successful. Now, Lutronic devices provide patented, real-time feedback while the procedure is being performed. Therefore, clinicians can optimize treatments for each individual patient – eliminating guesswork and helping to maximize outcomes. 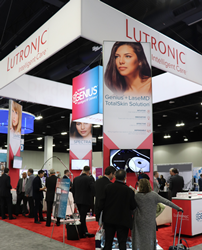 As one example of Intelligent Care, the Lutronic Genius™ was launched at the American Academy of Dermatology conference in early March. The clever RF platform uses patented, complex algorithms to interrogate the patient’s skin hundreds of times each second. This ensures that the amount of energy the clinician requests is indeed delivered in the time and location that was requested. Yet another example of Intelligent Care was unveiled at the ASLMS conference last weekend: the all-new Clarity II™. Following upon the success of thousands of Clarity™ systems sold worldwide, Lutronic’s new intelligent, multi-laser platform has already received CE mark and MFDS clearance and is pending U.S. FDA clearance. It provides proprietary Intelligent Tracking™ and real-time Temperature Sensing to help users deliver more consistent, efficacious treatment coverage and inform the users about treatment endpoints. Effective. Innovative. Intuitive. Dependable. These four core tenants fuel Lutronic’s development of intelligent laser and energy-based systems. Their robust products include proprietary features to help optimize care in aesthetic, ophthalmic, spinal and surgical procedures. Committed to this mission, Lutronic partners with key opinion leaders to advance scientific efficacy of Lutronic’s systems. To develop unrivaled systems with “smart” features, Lutronic devotes as much as four times what competitors invest in research and development, resulting in more than 535 current and pending patents worldwide. In addition to operations and manufacturing in the Boston area, Lutronic has a major manufacturing and research center in South Korea, offices in Germany, France, China and Japan, and a worldwide network of direct sales teams and distributors which is ever expanding. ©2019. LUTRONIC Group of Companies. All rights reserved. LUTRONIC, its logo, Lutronic Intelligent Care, Intelligent Design for Intelligent Care, Genius, Clarity, Clarity II, and Intelligent Tracking are trademarks or registered trademarks of the LUTRONIC Group of Companies. This product or the use of this product is covered by one or more US and foreign patents or patent applications pending. The crowd is curious about LUTRONIC's newest Intelligent Care Device - Clarity II at ASLMS in Denver, Colorado.some procedures (such as wrinkle reduction or laser hair removal), several weeks may pass before a practitioner knows if the traditional treatment was successful. Now, Lutronic devices provide patented, real-time feedback while the procedure is being performed. Therefore, clinicians can optimize treatments for each individual patient – eliminating guesswork and helping to maximize outcomes.